LDS footnote b for Genesis 2:10, interprets “branches”. 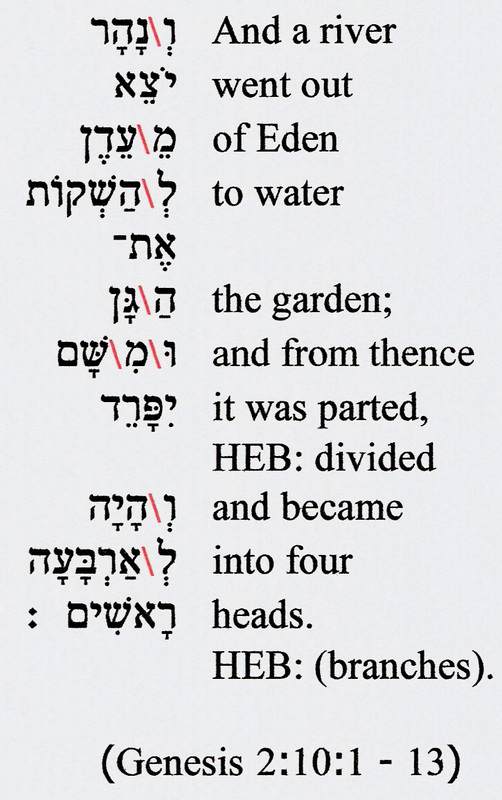 The Hebrew word “rashim” (“heads”) actually appears in the verse. The New Brown-Driver-Briggs-Gesenius Hebrew-Aramaic Lexicon (B.D.B.G) notes: “river-heads Gn 210”, pg. 911. The O.E.D. further indicates that this usage (“head” = “source of a river”) goes back many centuries. In other words, each of the four rivers beyond the garden, had a source (at higher elevation) called a “head”. There's no ambiguity here in the scriptural definition of a river’s “head”. In his vision of the Tree of Life, the Book of Mormon patriarch Lehi clearly defines a river’s “head” as it’s source from which it comes. (1 Nephi 8:13-14) This vision symbolically ties into Nephi’s vision of the land of promise. Heartland setting apologists assert that a river’s “head” could mean something else in scripture. They impose a meaning out of context. In the context of a body (anatomy) a conflux of fluids may be termed a “head”, but this is not how a river’s “head” is defined. A river’s “head” is simply it’s source at higher elevation. There are several rivers in the vicinity of Adam-ondi-Ahman, Missouri which flow together, each having independent heads, or sources at higher elevation. The Book of Mormon indicates that the land and city of Manti was “by the head of the river Sidon”. (Alma 22:27) If we presume that the city of Manti was at Huntsville, Missouri (as Heartland setting proponents insist), and if we spuriously define any confluence of rivers as the rivers’ “head”, then why would the mouth of the Missouri River uniquely qualify as the “the head of the river Sidon”? Why not the confluence of the Des Moines and the Mississippi just south of Nauvoo? This confluence is actually closer to Huntsville than the mouth of the Missouri! In Hebrew scripture, large and mighty rivers like the Nile and the Euphrates qualify as “yamim”, “seas”. (Isaiah 19:5; 21:1, Jeremiah 51:36; see B.D.B.G, pg. 411, entry 6.) Doesn’t it makes more sense to think of the Mighty Mississippi as a Nephite “sea”, rather than a passable river like Sidon? Actually it’s better to forgo the so called “Heartland setting” altogether and recognize the American heartland for what scripture says it is, “the south countries” – south of Lake Erie. (LDS D&C 75:8, Mormon 6:15) Though the heartland is Book of Mormon territory, it is not where the principal lands of the Book of Mormon (Nephi, Zarahemla, Bountiful etc.) are located. These situate near the “west sea”. (Alma 22:27-33) Given the location of Cumorah in scripture (LDS D&C 75:8), this “west sea” can only be Lake Erie.